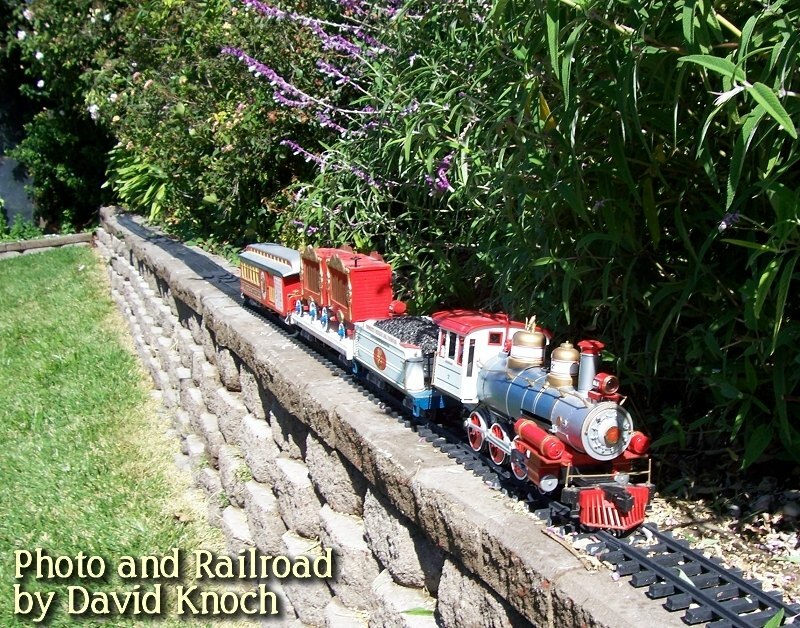 Editor's Note: Dave Knoch has been running battery powered trains in his garden railroad for many years, often on plastic or aluminum track. 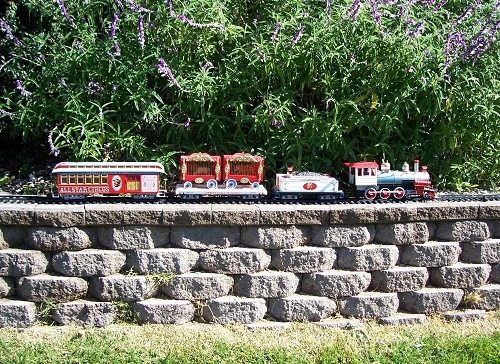 When he saw our article about Garden Railroading with Toy Trains, he offered to share some of his experiences with our readers. 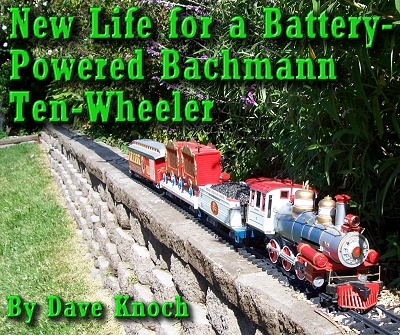 If you have an old Bachmann locomotive in need of repair, you might contact Bachmann before you do anything - they will fix all of their electrically powered locomotives for a flat fee, and sometimes they'll take a look at the battery powered ones too. But we included this article as an example of how to retrofit almost any battery-powered locomotive with a directional switch if desired. If you have any questions for Dave, contact us and we'll pass your comments to him. I bought the original battery-operated Bachmann 10-wheeler Circus Train years ago. After it broke, I put it in an old picnic cooler and basically forgot all about it. Recently we were cleaning out the garage and I decided to see if anyone at our Central California Coast Garden Railway Society would like it. I asked if anyone there knew how to repair it. The answer I got back was, "Why would anyone want to spend at least $90 to repair an old engine that was probably now worth only $40?" When I got home I looked at my beautiful red, white and blue engine and thought to myself, "What have I got to lose?" I decided to try and make it runable again myself. I no longer had the simple remote control that came with the set. So I figured I would simply operate it with a basic 3-way switch (forward/stop/backward) that you can get from Radio Shack. I laid my engine on a thick piece of soft foam, which would be my "operating table." First, I had to figure out how to pull the engine apart. I removed all the screws that I found in the bottom and sprung apart the tabs on the cab so it would slip off the base. I removed the running boards on each side. Eventually, the top finally came off, revealing the innards. Because I no longer had the remote, I removed the whole circuit board and most of the wires. Basically, the only wires I left were the red and blue power leads to the motor. I also took a hacksaw and removed any interior walls which would obstruct my new race-car type battery which I would use to power the engine. Next, I tackled installing the control switch. I removed the plastic bell from the top of the boiler and enlarged the hole large enough so that the switch could be installed. In the diagram above and the photo to the right, I show how I wired the motor to the switch. The colors of the wires are not significant for this application. 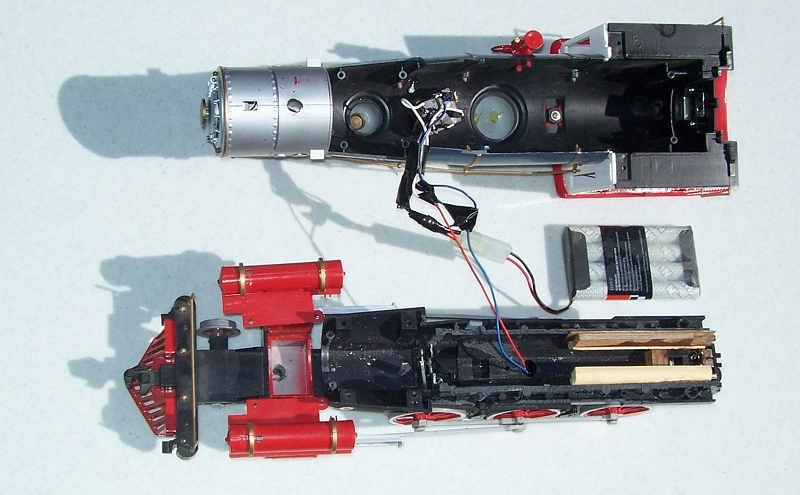 The main point is to have the motor wired to the center row of tabs on the switch. Then you need a line from each battery wire that splits off and feeds opposite sides of the outside row of tabs. That way when the toggle is thrown one direction, electricity flows through the switch (and through the motor) one way. 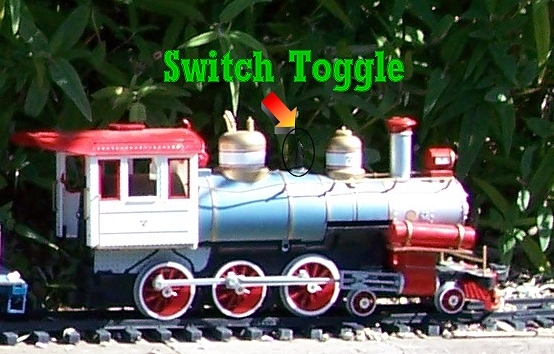 When you throw the toggle the other direction, electricity flows through the switch (and motor) the other way. When the toggle is standing up straight, no current flows to the motor. If you can only come up with a "double pole double throw" switch, you won't have the "off" position. I soldered each connection. Where the wires branched off, I covered the joint with electrical tape. To finish the job I reinserted the two screws in the sideframe (between the drive wheels), one on each side. To charge or change batteries all you have to do is remove these.